Vegan friends, look away. Just ignore this site for today, ok? This is the first, and possibly the last, steak recipe I will post here, at least for awhile. I don’t like red meat, so my poor, probably-anemic-by-now* husband who, incidentally, LOVES red meat, rarely gets any except for the burgers he makes a beeline for when I’m out of town. Granted, that’s not giving him nearly enough credit for his ability to cobble together a decent meal when left to his own devices, but for the record, he’s a little beef-deprived in this household. Now you know why, when he saw this recipe, his eyes bulged out of his head. 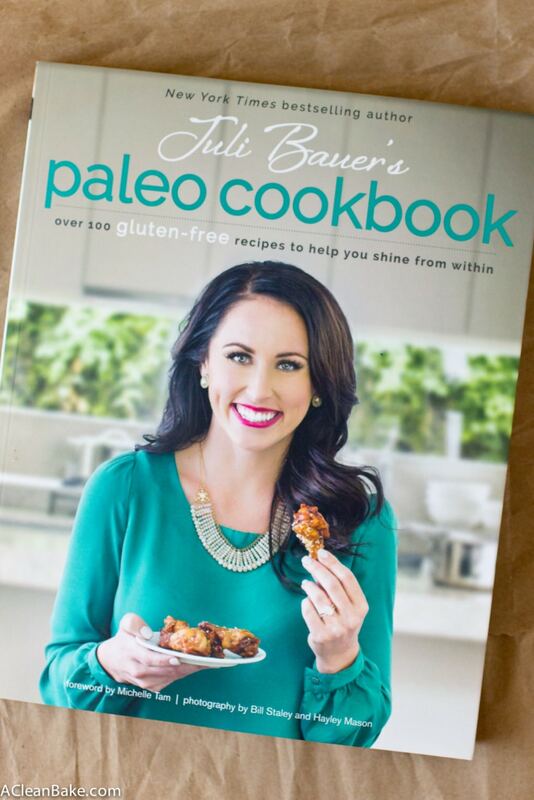 It’s from the latest beautiful cookbook by Juli Bauer (of PaleOMG) that is filled with stunning, gourmet-caliber recipes that also happen to be grain-free and, of course, paleo-friendly. Take this steak, for example: it’s just your normal everyday (I’m told) flank steak, marinated and cooked simply, dressed with fresh, zesty homemade chimichurri and garnished with sweet, juicy pomegranate seeds. To anyone who is interested in getting started on a grain free diet but isn’t sure what is left to eat, this is the kind of delicacy you’re in store for. That pretty much applies to everything in this book. It’s organized by course and type of protein so it’s easy to put together a plan for a day of grain free meals and you’ll never miss the grain or processed food. There are so many recipes in this book that I can’t wait to try, but I regularly force so much food on my poor husband – and he’s such a good sport about it – so I decided to let him pick this time. 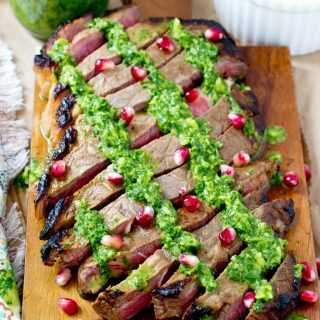 I’m so glad he chose this recipe because, while he enjoyed his annual steak allotment, I got to eat the excess chimichurri. This stuff is magical. I used it as salad dressing, mixed it with shredded chicken to make chicken salad, and drizzled it over grilled portabello mushrooms. It’s fresh, rich, bright and flavorful all at the same time, and lasts for a few meals. Plus, I’ll bet you could make extra and freeze it for those dreary winter months when fresh herbs are harder to find, and expensive and sad-looking when you do stumble across them. 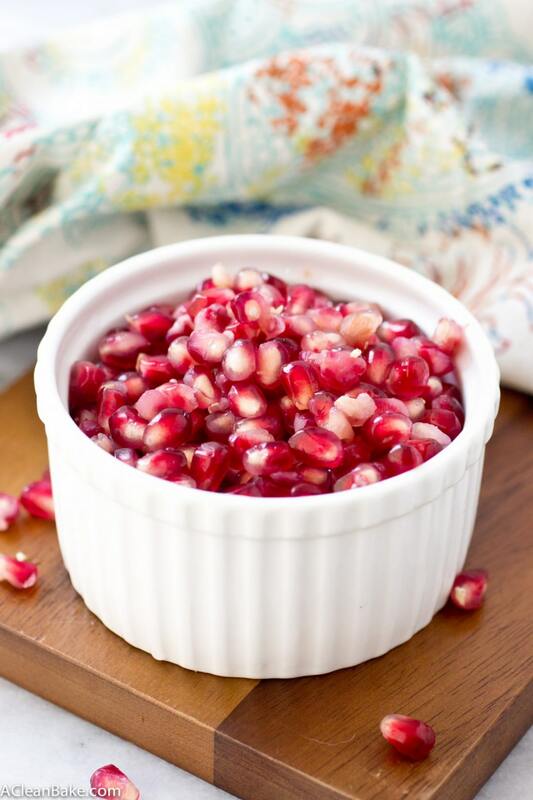 This recipe is also a great excuse to buy a pomegranate, which I never, ever buy for some reason. I like the seeds, but used to make a huge mess trying to extricate them from their pulpy, fleshy little fruit prisons until I learned this simple trick. Try it – it works. 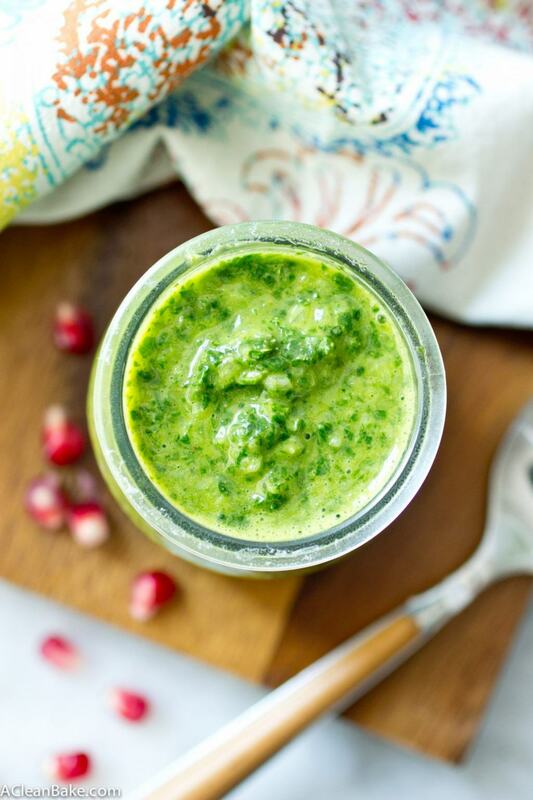 Paired with the vibrant green chimichurri, these bright crimson seeds look so Christmasy. At least that’s how Juli introduces the recipe and now I can’t un-see it! That’s another thing I love about this book, actually: the casual, easy, conversational tone of Juli’s writing that makes reading her recipes feel like a chat with an old friend. Some of these recipes may seem daunting at first, but I can almost promise you: they aren’t. I, for one, was pretty petrified of cooking a steak. It’s an expensive piece of meat and I thought it would almost surely end up a disaster. But Juli made it seem so simple and approachable, I just had to give it a try. Actually, this recipe calls for grilling the steak, but, instead of firing up the grill, I ended up using the searing technique Juli uses for her pork chops on page 132 – basically med-high heat, plenty of fat in the pan, and don’t touch the meat except for one flip. These recipes get points for approachability in my book because they are all comprised of normal, everyday ingredients that most of us can get our hands on at any grocery store. The exception, as always, is the desserts chapter which occasionally calls for semi-unusual ingredients like maple sugar and tapioca starch. But, for the most part, these recipes are shockingly straightforward and a great jumping off point if you’re trying to move toward a paleo, or any whole-foods-based, diet. So, I hope you all enjoy this juicy steak. 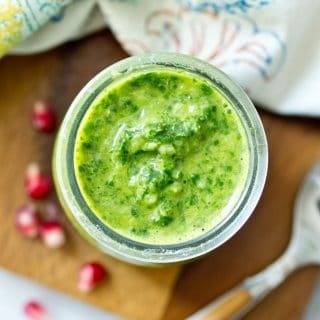 I’ll be ransacking the fridge looking for more things to put this chimichurri on. In a large zip top bag, combine the oil, coconut aminos, lime juice, garlic, cilantro, salt and red pepper flakes. Seal the bag and shake vigorously to combine. Add the steak to the bag, seal and set in the fridge for at least 3 hours (overnight is even better). Preheat the grill to medium heat. Remove the steak from the refrigerator (discard the bag and marinate) and place it on the grill for 2-3 minutes per side for medium rare. Remove the steak from the grill and cover it with foil. Allow it to rest about 10 minutes before slicing. 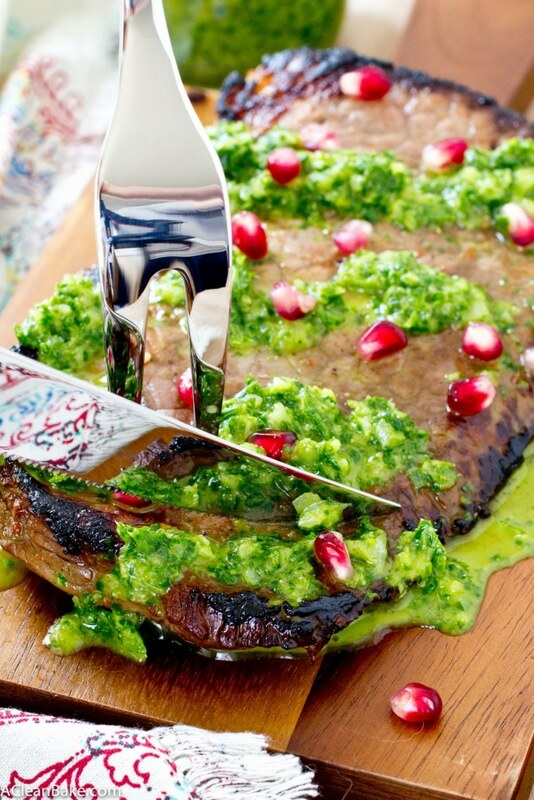 Thinly slice the steak against the grain, then top with chimichurri and a sprinkle of pomegranate seeds. I didn't have coconut aminos on hand, so I substituted 1/4 cup tamari instead. As I said in the post, I didn't grill the steak. I pan-seared it instead by adding about 2 Tbsp oil to a preheated heavy-bottomed pan (just enough oil to cover the base completely without it pooling), then adding the steak. I cooked it, partially covered for about 5-7 minutes, over medium high heat, until a crust appeared. Then I flipped it and did the same on the other side. Increase cooking time to cook it through, and decrease the cooking time if you like it more rare. Makes 1x1-lb steak (about 2 servings). Store leftovers in an airtight container in the refrigerator for up to 3 days. This recipe can be found on page 116 of Juli Bauer's Paleo Cookbook. It has been reprinted with the author's permission. Store the sauce in an airtight container in the refrigerator for up to 1 week. This recipe can be found on page 284 of <a href = "http://amzn.to/1VbeEjw". It has been reprinted with the author's permission. 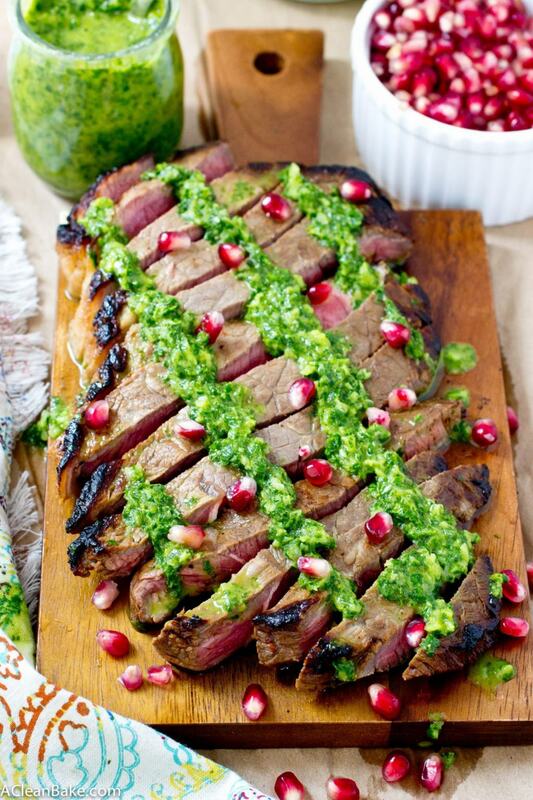 Oh the chimichurri is so versatile! It would taste great on grilled tofu or tempeh too! 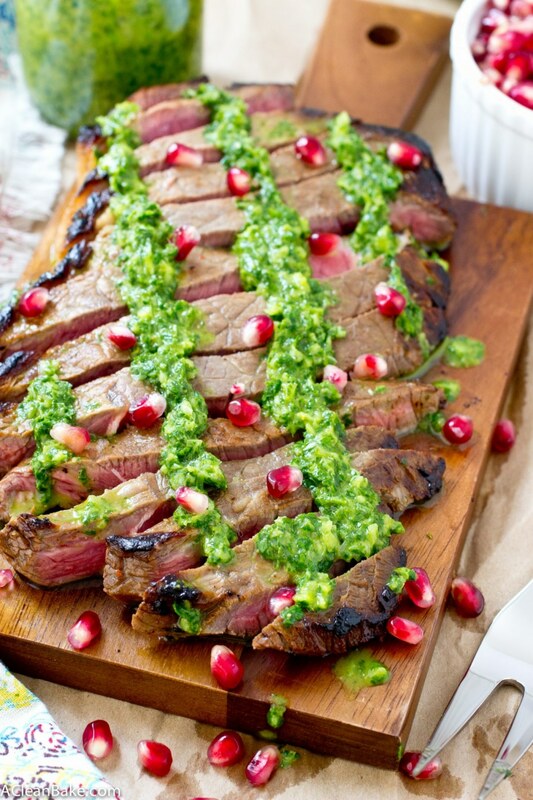 What a vibrant and delicious-looking steak! Your lucky husband 😉 They say things taste better when you can’t regularly have it. And boy does that cookbook sound amazing! What a great steak. And the picture is beautiful and tasty. Yummy! How much oil goes into the marinade?